When I left school to find a job in the real world, I really had no idea that online marketing, let alone email marketing, was a thing. Embarrassing, I know. Luckily, I learned fast. After a year working as an email retention specialist in the marketing department of a major online business publication, I quickly understood the importance and power of email marketing as well as how to best harness it. And in order to harness the power of email marketing, you must be sure your emails are actually opened. On average, your marketing emails have about only about a 1-in-5 chance of being opened which means for your e-marketing campaigns to truly be successful, you must look to modify your practices. The email landscape is constantly changing. There used to be a time when getting email was exciting; emails would appear in your inbox, and you would be alerted with a happy sounding “You’ve got mail!” Now, that announcement has gone from being happy sounding to seriously annoying. At this moment, I have 934 emails in my Primary Inbox – the important inbox. I have only 88 emails in my Social Inbox (apparently, I must be living in an antisocial cave), 1,430 emails in my Promotions Inbox, and 640 in my Updates Inbox. Overall, that’s 3,092 emails in my Inbox. Ouch. So… How do you harness the power of email marketing without becoming just a number in an inbox? I’m sorry to say I can’t give you a point-blank answer. This isn’t magic, and if it was, I’d be making millions! However, I certainly can point you in the right direction. Here are a few things that can help boost your email open rates. Keep it short. Mailchimp suggests that you keep your SL at 50 characters or less. Make it relevant. The people you’re contacting should already know who you are, thus you’ve already ensured that the content you’re sending is targeted to interested recipients. In fact, a study conducted by MailerMailer found words that are used to convey relevance (news, newsletter) are the most popular within subject lines. Keep it specific, direct and somewhat urgent. Along the same lines, don’t try to be vague and distracting with your subject line. You’re using it as a way to engage your contacts, enticing them to interact. Let them know why they should open it. Inform them right off the bat why you’re contacting them, and allow them to react instantly. Make it stand out. I know, it’s not easy. You’re limited in terms of characters and formatting. So just do what you can. Use punctuation, capitals, and heck, now you can even use emoticons! But only do what makes sense. Nobody wants to open a ***CLiCk hEre!! *** email. God knows what they’ll find inside! Believe it or not, your From Field holds importance as well; it allows you to assert yourself, prove yourself a credible sender and reinforce your relevance for your contacts. You can choose to include your actual name, your organization’s name, your position or whatever else you believe will be appear as most appealing to your contacts. However — a word to the wise: Emails sent using a real person’as name in the “from” field rather than a company email address improves your email open rates. And not by a little bit – research by Pinpointe found that using a person’s name can improve open rates by up to 35%. So work on establishing your name and your personality – for if your potential customers know you, trust you, and see your name in their inbox – there’s a strong possibility that your email will be opened. The way we send and read emails is always changing. Once upon a time, personalization (“Hi Kristen, have you taken advantage of our latest offer?”) in the subject line worked. 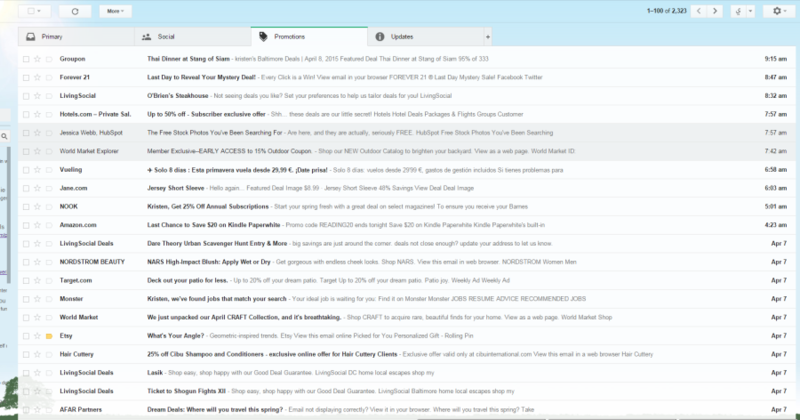 Now, MailerMailer found out that these types of emails have lower open and click-through rates. What once was a best practice is now a big don’t. While I recommend that you stay on top of best practices, always watch your own analytics to determine the impact they’re having on your marketing. Don’t’ be afraid to push the envelope. Test. As you strengthen your email marketing campaigns, you will need to test to learn what gets the best results for your contacts. Maybe you’re appealing to an older demographic and they prefer a much longer, detailed and informative subject line. Maybe they love a subject line that tells them that your product is FREE!!!! Your contacts could be the outliers. So though I’ve listed some of the best practices for open rates (for more details, you should definitely check out MailerMailer’s awesome infographic), these best practices may not apply to you as an email marketer. Don’t be afraid to try something less established, less supported. Remember, change has to start somewhere; it could start with your email marketing campaign.